Habit: Annual to perennial herb [shrub]; sap milky. Stem: erect, smooth, distally branched. Leaf: basal and cauline, alternate, +- entire to toothed and coarsely pinnate-lobed; cauline generally sessile, clasping. Inflorescence: heads liguliflorous, in cyme-like clusters; involucre swollen at base; phyllaries generally in 3 series, outer many, short-triangular, inner series linear, tapered; receptacle +- flat, epaleate. Flower: many; ligule yellow, readily withering. Fruit: generally +- flat, beakless; pappus of many fine, white bristles. Habit: Annual 1--14 dm. Stem: often proximally branched. Leaf: basal generally < cauline, generally tapered or abruptly wing-petioled; cauline 5--35 cm, distal often widest at base, proximal clasping lobes acute, not curled or coiled; blades nearly all lobed except in dwarfed pls, lobes variable in width, terminal lobe often widely arrowhead-shaped. Inflorescence: peduncle 0.5--7 cm, glabrous to bristly-glandular, sometimes cottony-tomentose just proximal to heads; involucre 10--13 mm. Flower: ligule +- = tube. Fruit: 2.5--3.8 mm, flat, 2--4-ribbed, cross-wrinkled, dark brown; pappus bristles +- 2 × fruit. Chromosomes: 2n=32. Ecology: Abundant. Disturbed places; Elevation: < 2500 m. Bioregional Distribution: CA; Distribution Outside California: North America; native to Europe. Flowering Time: All year Note: Much like Sonchus asper. 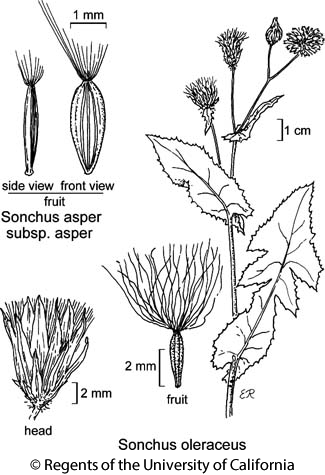 Citation for this treatment: David J. Keil & G. Ledyard Stebbins 2012, Sonchus oleraceus, in Jepson Flora Project (eds.) Jepson eFlora, http://ucjeps.berkeley.edu/eflora/eflora_display.php?tid=5118, accessed on April 19, 2019.